Emaar Properties plans to build its first beachfront hotel project in Dubai – The Address Jumeirah Resort and Spa at Jumeirah Beach Residence (JBR). 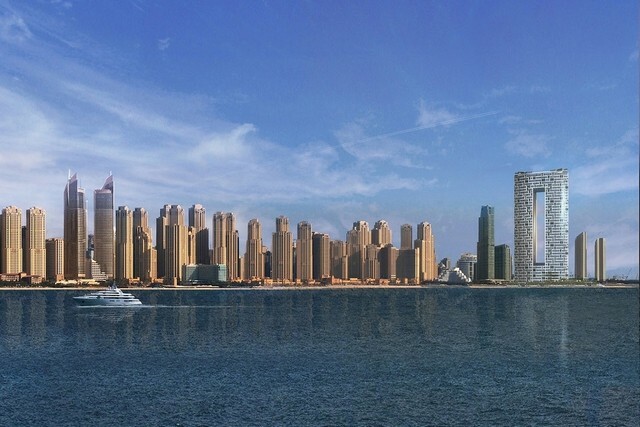 The company said that the resort will contain a pair of 74-storey towers at the end of Dubai Marina, with 100 metres of beachfront looking out on to Meraas Holding’s Bluewaters Island and the Ain Dubai big wheel. It will be housed on a site next to The Beach development at JBR, and will have a direct link to Sheikh Zayed Road. The 290 metre-high towers will contain 19,690 square metres of area comprising a 182-room hotel, serviced residences and residential apartments. The ­hotel and serviced residences will be housed in one tower, and the apartments in the other, although they will share a common podium. There will also be a rooftop infinity pool and five food and beverage outlets, including a lounge at the top of the building. A void space between the two towers has been created to “maximise sunlight and views”, the developer said. Other facilities include an all-day dining restaurant connected to a pool, a signature restaurant, beach grill and a lobby lounge. It will also have several boardrooms and a ballroom, a spa and a fitness centre. The landscape of The Address Jumeirah Resort + Spa is broken down into terraces of greenery, outdoor lounges, restaurants and pools that cascade into each other. Seprate pools have been designed for adults and children with some of them dedicated to hotel guests and others for residents. A series of grand stairways on the terraces allows visitors to walk from the beach up to the lobby level. The company expects the project to start within the next three months and be completed by 2020.